CCEI researchers at UD have outlined a strategy to create renewable lubricants from non-food biomass, such as woodchips (above), grass, and other organic waste. Researchers at the University of Delaware-led Catalysis Center for Energy Innovation (CCEI) and investigators from its partner institutions are working to solve these problems. 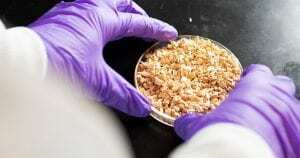 Their findings report a strategy to create renewable lubricant base oils efficiently from non-food biomass — things like wood, switchgrass and other sustainable, organic waste — and fatty acids, which are present in used vegetable oils and animal fat.